The most famous publishing house in Cologne, Germany presents art zines and artist books. 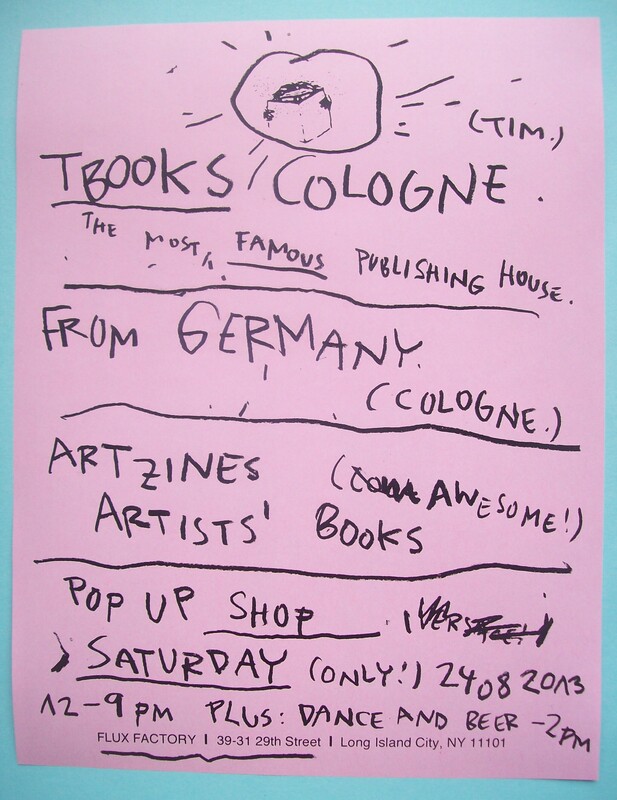 The TBOOKS COLOGNE Pop Up Shop at Flux Factory will feature new publications + new drawings by Flux Artists-in-Residence Philip Emde and (Tim). Dance and beer till the cow comes home, with tunes by Nina Kravitz + other famous boiler room residents. Residency Unlimited/Flux Factory Artist-in-Residence Sonya Schönberger, and participating Public Trust artists Nathaniel Katz & Valentina Curandi, Heidi Neilson, and Jo Q. Nelson will talk about their recent projects.